M3rNi3: Blogging by Mail: My Package Has Arrived! Blogging by Mail: My Package Has Arrived! I participated in yet another Blogging by Mail event! Woohoo .. It is hosted by none other than Steph of Dispensing Happiness. You basically submit your details to Steph and at the end of the sign ups, she would match up participants with a partner. The theme to the BBM package this time around is A Few of My Favourite Things! The package arrived while I was away at work! My hubby was at home to receive them! He didnt call me to inform but only told me in the car while on the way home from work. Gosh you should know how eager I was to get home! The moment I reached home, I took my camera out and started snapping pix of my "baby". Yay .. the package was from a beautiful lass named Brooke of Bear Necessities. The things she had included in the package were all just soooo awesome. 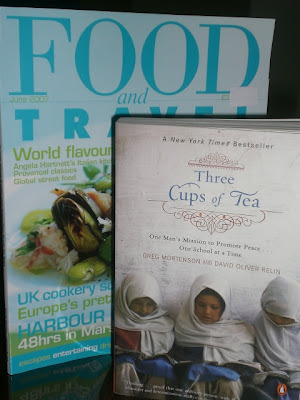 Take a look at what she gave ..
Brooke had included in the package a Food and Travel magazinefrom the UK which features alot of travel places and recipes too. A book entitled Three Cups of Tea on a man's mission to promote peace .. lotsa rave reviews on this book. I just cant wait to start reading this once I am done with the book I am currently reading! Brooke had also baked some very nice heart shaped hibiscus shortbread for me! Gosh, I couldnt help but dived in on this one when I saw that it was made of hibiscus tea .. they were reeeeeeeeeeaaaaaaaaalllyyyyyyyyyy delicious! 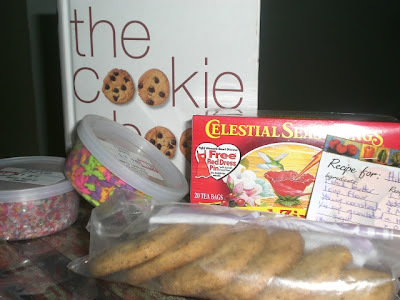 Oh ya, she had also kindly included a recipe card on how to make the hibiscus shortbread plus a box of hibiscus tea .. 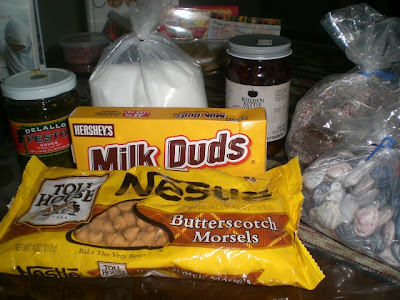 I will definitely try making some myself soon! Knowing that I love to bake cookies for my girls, she gave me a cookie book, which she had kindly taken from her collection .. I hope it was not a hard decision to make, ie. to part with a book from your own collection and then giving it to me .. I'll definitely treasure them! Hell yeah .. another book to add to my collection .. really lucky me! And yah, she also gave me coloured sugar and dino shaped sprinkles too! Brooke really did her homework, she must have read the whole blog of mine. She had noticed that I had difficulties some caramel chips here and had kindly bought me some butterscotch flavoured chips .. oh yeah Brooke, thats definitely an adequate sub! Next, Milk Duds, Brooke's favourite choc which she always get when she goes to the movies. I have tasted these and boy were they really nice, sweet and caramelly .. really my kinda stuff! And more chocs, freckles and sea shells .. too pretty to eat .. heheh .. Brooke said the sea shells tastes like M&Ms. She also noticed I mentioned about Sea Salt in my specs and she got me a pack. And the last thing she included was a jar of Cranberry Orange Marmalade .. never mind the debate Brooke, I am most happy to receive them anyway .. ;-)) .. I'll definitely share this one with my mum coz she loves marmalade too! So thank you thank you thank you Brooke from the bottom of my heart for your kindness and generosity .. I lurrrrrvvvvvveeeeeeee each and everything that you've included in the package! You just soooooooooo knew what I like! My package is now travelling to some place which I'd love to visit sometime! Cant wait for my partner to receive them. Till the next BBM, ciao! I love prying into other bloggers' BBMs and it has been some time since i last read a BBM post. im living vicariously through you! lol. bet you are slowly rationing the goods...happy munching! p.s. this blog is terrific... thumbs up! yep .. it is soooo much fun prying into other BBM packages .. seriously ..